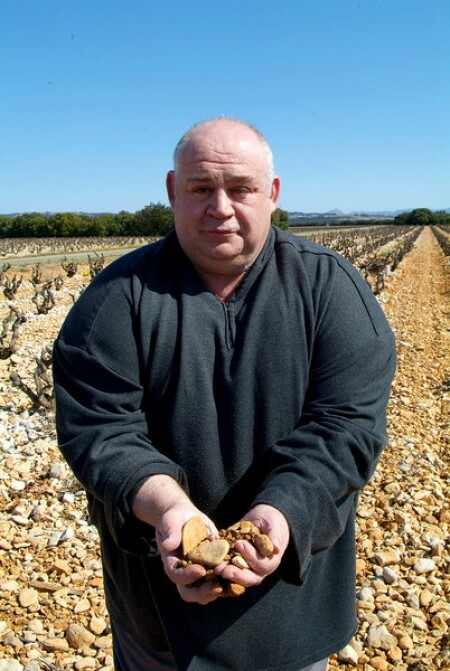 This last April those who revel in Châteauneuf du Pape put down $275 a pop for a mega tasting at the Paso Robles Inn where they were on the receiving end of animated commentary by one of the rare virtuosos in the Southern Rhone wine world, the uber vigneron Philippe Cambie. Cambie looks like someone you would not want to lock shoulders against in a rugby scrum, but then he played rugby on a national level in France and he is fond of saying that managing a vineyard is akin to coaching a rugby team, although despite his breadth, or because of it, he exudes a gentle Zen-like blend of focus and calm. Achieving Zen Master status in the Southern Rhone wine industry came quickly upon training as an oenologist in Montpellier – after some years spent in the food industry – and joining an oenological laboratory in Beaune de Venise where he consults directly with wine estates. As a consultant to wineries – there are 60 estates listed on his web site – Cambie goes beyond the standard oenologist lab coat role in vinification, asserting his passion and knowledge into every phase of wine making, beginning with maxing out the potential of the terroir, all in support of his persistent motif that attributes 95% of a great bottle to what comes down in the fields and the vines before the harvest. Moreover, Cambie is a voracious ambassador for Grenache, the red grape variety that thrives in the heat of the Southern Rhone, heralding it as one of the world’s greatest varieties while offering a humble reflection that Grenache presents the greatest challenge to produce majestic wine. Omnipresent at seminars, conferences, wine fairs, tastings, press interviews and wine excursions, Cambie was tabbed “oenologist” of the year in 2010 by Robert Parker. 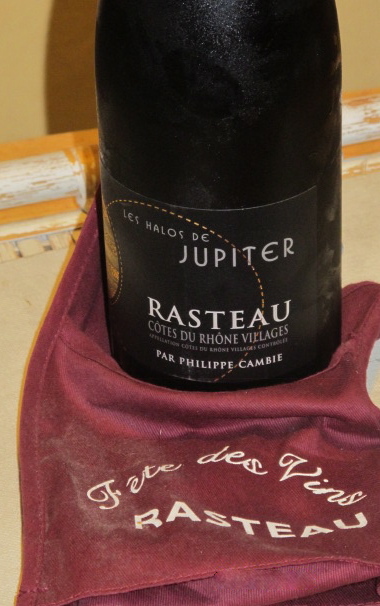 So it’s only logical that Cambie, reaching brand status, has joined with some friends to bottle his own labels: Calendal and Halos du Jupiter, both available in the states (see below). – Think Mourvèdre, the grape variety that Cambie touts for blending in small quantities with Grenache. Mourvèdre regulates the balance and adds structure and freshness. 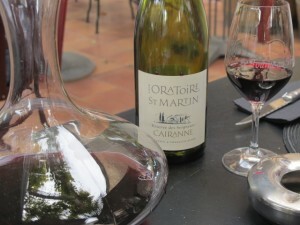 A reminder that when buying Southern Rhone wines to read the back label to check on the various varieties in the blend. – Emancipate yourself from the new oak barrel rage. 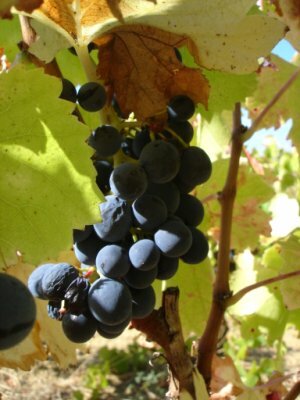 Grenache is a variety that is low in both pigment and malic acid, and oxidizes readily. Thus, Grenache ages well in cement vats and stainless steel tanks, practices dominant among Southern Rhone producers. – Consider Cambie’s dictum that alcohol levels in wines in excess of 14% – or so called hot wines – are not critical. Rather it is the freshness and the balance of fruit, acid and minerals that assuages the alcohol to create a pleasing if not a great drink. – Pair Grenache blends with spicy dishes as the intensity of the fruit cleanses the mouth of spices after each bite. And now you know why Cambie is very keen on the Chinese market for Southern Rhone wines. The thing that draws people around Cambie is that he exudes a warm intense full-hearted interest in wine, sort of the way you talk about someone you love. Wine isn’t just science, it’s an emotional attachment to an entire landscape – he assigns himself as “un homme du Sud” – and to a way of striving for perfection, with the cooperation of nature mind you. Taste one of his Grenache blends and savour the terroir of the Sud! Châteauneuf du Pape Adrastée – Châteauneuf-du-Pape – Châteauneuf-du-Pape Blanc – Gigondas – Vacqueyras – Côtes du Rhône Villages – Rasteau – Côtes du Rhône – Costières de Nimes – Costières de Nimes Blanc. The Côtes du Rhône Villages Plan de Dieu is appelletion of more than 1,500 acres northeast of Orange. This cuvée, which Cambie produces with Gilles Ferran from 9 acres of vines, is equal parts Grenache and Mourvedre, a rich and powerful blend that offers aromas of intense fruit from very old vines. This wine makes Cambie’s point that a balance of fruit, acid and minerals trumps high alcohol levels.